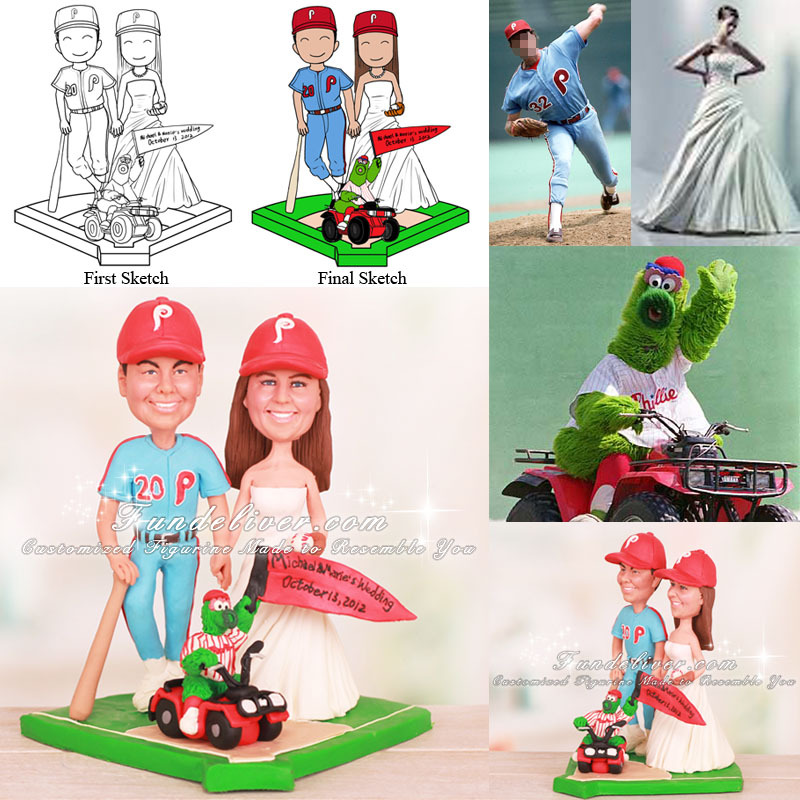 This is a completely customized Phillie Phanatic on 4 wheeler in front of bride and groom wedding cake topper ordered by one of our customers. It is kinda boring by just simply describing the layout of this topper, however their love story and idea are amazing, so we post them below and thanks Marie and Mike for sharing their great story and idea. My fiance and I met at the Phillies game believe it or not. We both had partial season tickets. While sitting in my seat enjoying the first game of the season, I kept hearing a contagious laugh which in turn made me crack up. There he was having a great time with his buddy and somehow we all started talking. Every game after that, we would all meet up beforehand and tailgate; drinking, eating and have a great time. Mike always asked me out but I, playing hard to get, kept trying to put him in the "friends zone". Poor guy. Well somewhere along the way, I fell for him and we've been happily together ever since. Now we are planning our wedding and we NEED to have a cake topper from your website. Mike (Groom~Caucasian with blue eyes and dark brown hair) will be wearing the throwback baby blue uniform with the maroon "P" including stirrups and hat. He will be smiling and leaning on a Louisville slugger baseball bat with one hand and holding the Bride's hand with the other. Marie (Bride~Caucasian with blue eyes & brown hair) will be wearing her wedding dress (ivory) with a pearl necklace. She will be smiling and holding a baseball glove with a ball in it with one hand and will be holding the Groom's hand with the other. (I always brought a glove to the games in hopes of catching a ball~haven't yet). She will be wearing the matching baby blue hat as the groom. Hair should be down under the cap. 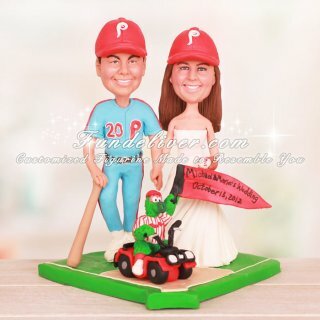 In the front of the Bride & Groom would be the Phillie Phanatic on his 4 wheeler holding a banner/pennant reading "Michael & Marie's Wedding ~ October 13, 2012". We will all be standing on a baseball field as the base of the topper.